Now that we live in the South, I try to incorporate BBQ whenever possible. 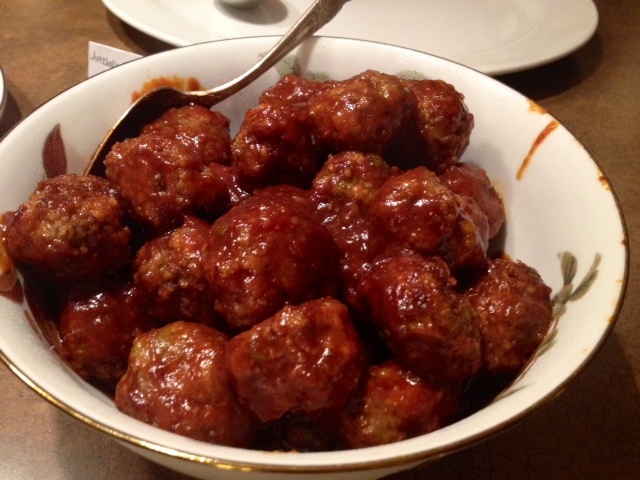 I made these delicious little BBQ meatballs for a dinner party last weekend and they turned out great. My husband, who is currently obsessed with BBQ, especially loved these. The recipe is gluten-free but you could certainly make it with regular ingredients if you don’t want gluten-free. I’ll be making these again at my next dinner party! Makes ~20-25 meatballs depending on size. In a large mixing bowl, add the ground beef, eggs, breadcrumbs, green onion, ketchup, garlic powder and salt/black pepper. Combine the ingredients using a spoon or your hands so all of the ingredients are mixed together well. Form the meat into small sized balls and line up on a baking dish sprayed with non-stick spray. Bake in a 400 degree oven for about 20 minutes. After 20 minutes, pour the BBQ sauce over the meatballs, cover the dish with tin foil and bake for an additional 20 minutes. ← Thai Peanut Tofu & Zucchini.